"Willa is freaking out. It seems like she's seeing things. Like a dead body in her swimming pool. Frantic messages on her walls. A reflection that is not her own. It's almost as if someone -- or something -- is trying to send her a message. Such a chilling book! I drove through this book so fast, I would love a sequel! 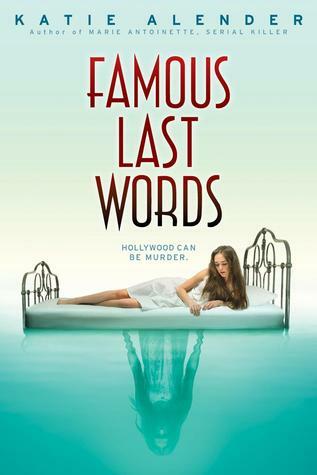 Famous Last Words takes on the concept of the movie Gothika and maneuvers it into the YA genre with hauntingly ease. A serial killer is going throughout Hollywood killing and staging young aspiring actresses, and try as they might, the police can’t get of a grasp on who it might be. Willa, who has recently dabbled in summoning rituals to get in contact with her dad, just moved to L.A. and is gradually haunted by a spirit. Is this spirit connected to these murders? What are they trying to tell Willa? Willa must learn to live with this ghost and put up with their threats and alarming antics. I greedily read through this book, even though I had figured out who the murderer was really early on. I’m not sure if this was because I’m a huge mystery buff, or not, but the author sustained my interest with great plot twists and wonderfully imaginative scenes. Famous Last Words is a loving marriage of mystery and the paranormal, which when done right, wins my vote. This book was a great fast-read full of thrilling suspense, mystery, and a horrible haunting. If you love these elements in movies like Gothika and books by Stephen King, you’l go wild for these elements put in a YA twist. i could never figure out the murderer myself so it must've been your talent haha. What did you think of the book? I, personally, thought it was a good read but didn't like the contacting the dead part. Maybe it's because I read too many mysteries, lol! I liked the book, especially for the season :D I can understand her curiosity to contact the dead, though, she lost a loved one & had so many questions. She felt like she didn't get closure. What is your personal opinion about this book? I thought it was good,but really creepy. Please relpy back because I need you to for this school project I'm doing.